It is time for a barbeque but with the rising heat in London, I don’t feel like eating anything heavy. Over the past week, I have been in the search for some simple food that will be both refreshing and delivers on taste. I found just that at VietCafe, the first restaurant I have gone as part of my new TasteCard food review series. This lime green and bright orange cafe restaurant in Haymarket is full of brightly coloured and seriously good Vietnamese cuisine. 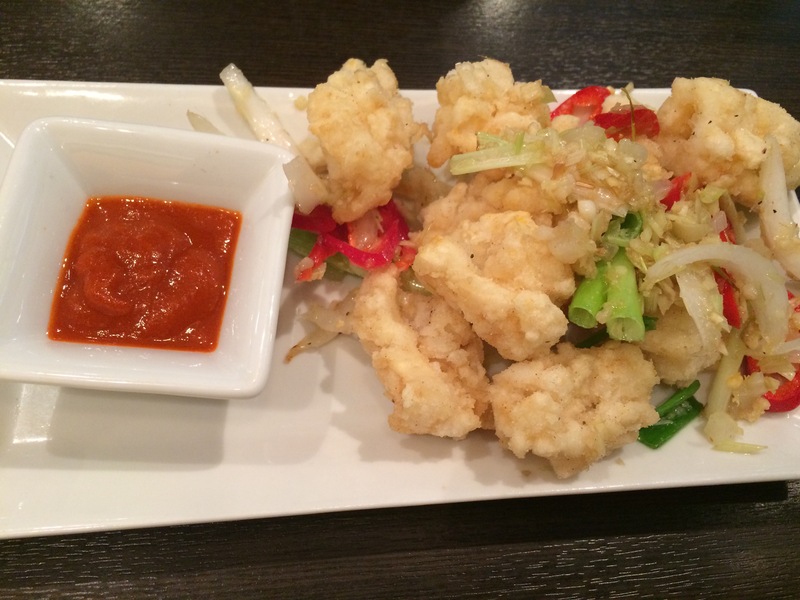 Through TasteCard, VietCafe is offering a 2-for-1 deal on starters and mains. We went straight in an ordered Muc Rang Muoi (chilli salted toasted squid), Nom Du Du Tom (Green papaya salad with prawn), Pho Xao Hai San (Pho noodle fried seafood) and Pho Hai San (Seafood Pho). The Muc Rang Muoi was as I expected. Piping hot squid in a light salty batter, garnished with leeks and onions. The sriracha dip seriously packed a punch with the surprise level of spice along side the sweet red peppers. The contrast in flavours in each dish we ordered left quite an impression on me but not as much as the second starter. I totally couldn’t get enough of the wonderful mix of ingredients in the Nom Du Du Tom. Each bite was full of freshness, a delicious crunch and totally unique. 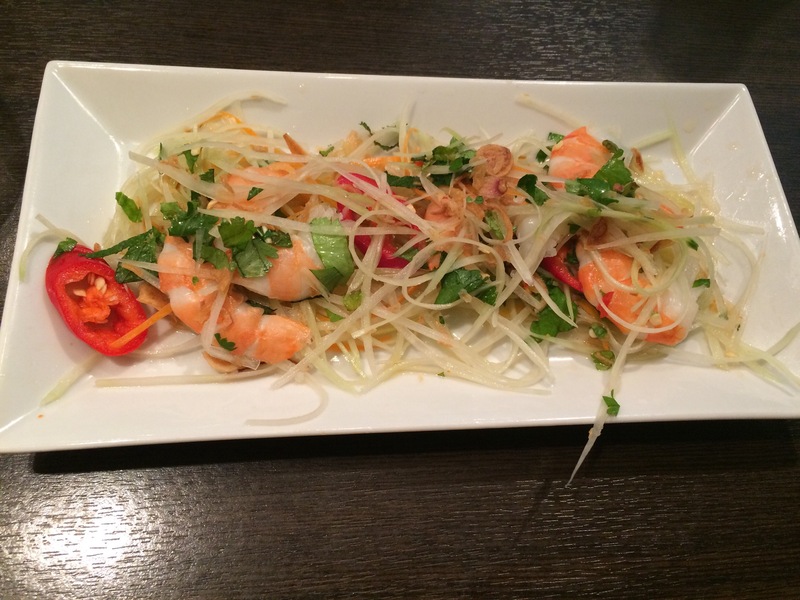 The key element of the dish was the green papaya. It has the unique ability to absorb and elevate the mix of sweet, vinegary and zesty flavours of the dressing. It is also a great low-calorie option, high in fibre with the addition of shredded carrot and includes protein filled sliced prawn. Not to mention a great watery appetiser to prepare you for the mains. Up next was the Pho Xao Hai San. It was a hot plate of colour and texture. 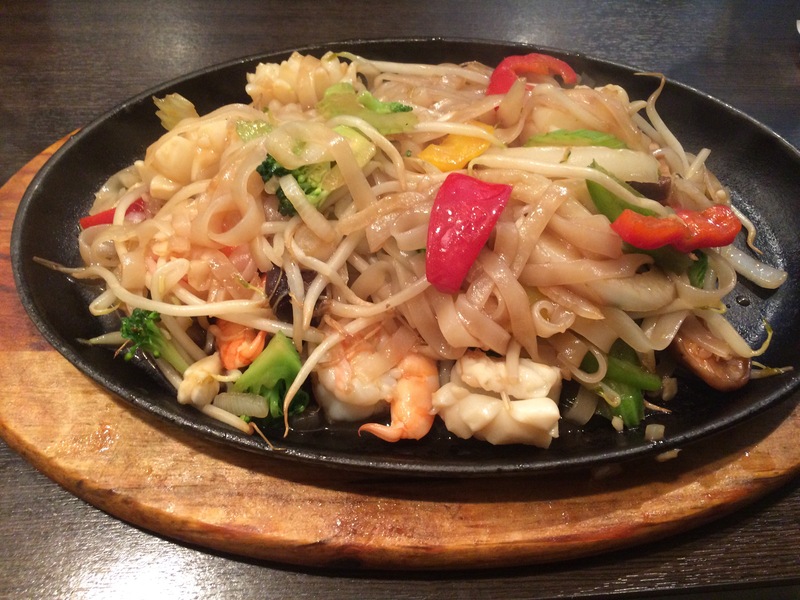 Filled with goodness with boiled prawn and squid, freshly blanched broccoli, beansprouts, celery and peppers and sweet shiitake mushrooms. Absolutely delicious!! The only thing I couldn’t help but notice was that it included only one lone scallop in the mix of fried noodles. This was the same with the soup version of the dish, Pho Xao San. I suppose this is to be expected as scallops can be an expensive delicacy to purchase for both customers and smaller restaurant. Nonetheless, the seafood pho was very light and refreshing. I loved the flavour of the lime juice, leeks and coriander in the seafood broth base. The only thing it we needed was more noodles. They were so good we gobbled them all up before we could gulp down all the broth. VietCafe is definitely the perfect lunchtime spot for two. The best thing is that it won’t break the bank as the total bill was £27.34 (or £13.67 each) instead of £40.75. We did also order water but stupidly forget to say “tap” water and lost out on an extra saving of £2.75. Nonetheless, it was still a good TasteCard deal. So, come and fill your tummy at VietCafe. Also, don’t forget to come back for more Tastecard food reviews.